Now you can enjoy tales of Burlingame and Hillsborough history from any computer. Just like our museum inside the Burlingame Train Station, our online exhibit space is periodically updated with in-depth reviews of individual subjects related to the area. You might be considered a psuedo-historian after visiting one of these fine exhibits. Pacific City, “The Coney island of the West”. Pacific City was an amusement park promoted by the Tri-City Chamber of Commerce, local businessmen and civic leaders who envisioned the area would rival Coney Island and Atlantic City. Note: See complete slide show “The Rise and Fall of Pacific City – The Coney Island of the West” by clicking on this link. Please be patient while program loads! The entrance to Pacific City Amusement Park at Coyote Point. Discovering Subdivision History: Lyon & Hoag, Easton Addition and Mills Estates (Historical overview).Burlingame Subdivisions for WEB PowerPoint presentation Please be patient, presentation takes a few minutes to download! The Easton Additions (Historical overview) Easton Additions adaptation for website Please be patient, presentation takes a few minutes to download! Peninsula Royalty: The Founding Families of Burlingame-Hillsborough [link opens a new website]. In the mid-1800s, The Howard, Mills and Easton families purchased vast tracts of windswept, barrenland on the mid-Peninsula where they built huge country homes in search of a quiet refuge in the country 15 miles south of San Francisco. Fire dept history – Where’s The Fire? A Pictorial History of Burlingame and Hillsborough’s Central Fire Dept. Severn Dairy Wallscape. In June 2000 the Regan Building on California Drive was demolished to make way for a new structure. 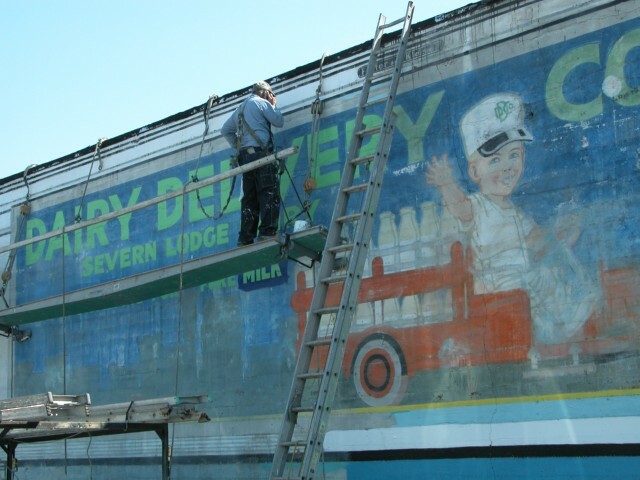 When the walls came tumbling down, a surprise was in store: a beautiful wallscape advertising the long gone Severn Dairy.